The birth of the Laser RangeFinder revolutionised the golfer’s experience, allowing players to accurately plan shots, select clubs and properly attack the course. Using an invisible beam of laser light shot at a specific target, these devices help to determine distances, hazards and pin locations with accuracy and ease. Unlike Golf GPSs there’s no downloading or subscriptions needed. The look, aim and fire approach of the Laser RangeFinder makes it simple to use and adaptable to a variety of conditions you may encounter on the course. Utilising the latest in golfing technology to help you lower your scores and possibly even your handicap! Bushnell pioneered the Golf Laser RangeFinder two decades ago and continues to be a key innovator within the industry, with brand ambassadors including Rickie Fowler and Lee Westwood. For over a decade the Bushnell brand has been the number 1 Laser RangeFinder used on the PGA Tour and was an Official Licensee of the 2014 Ryder Cup at Gleneagles. 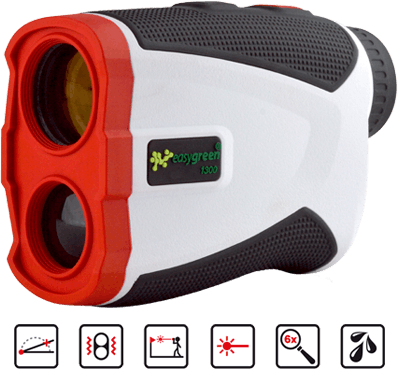 At GolfOnline we stock a variety of RangeFinders to make your time on the course a more enjoyable experience. From the latest Bushnell designs to incredible Nikon options, you will find the perfect gadget to help start shaving strokes off your weekend scores.